In the United States, young adults must be 18-years-old to vote in most government elections. 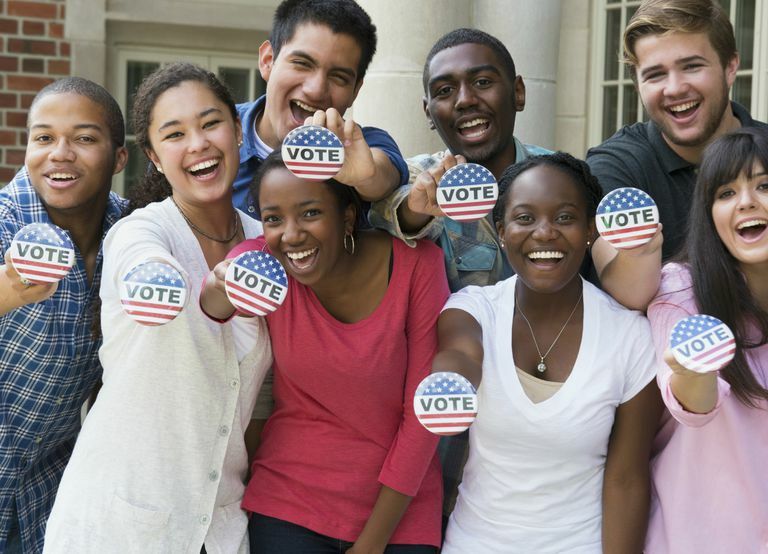 Teens may be eligible to register to vote as early as 17 in some states. A teen in the U.S. is able to register to vote in the year that they will turn 18. So even if your teen doesn't turn 18 until December, she can register to vote any time during the calendar year. Voter registration forms can generally be found in your state department offices. Many states now offer online registration. Encourage your teen to register to vote. Talk about the importance of becoming an educated voter and encourage your teen to think carefully about the issues and candidates on the ballot. There are some states that allow a 17-year-old to participate in primary elections and caucuses if they will turn 18 on or before election day. As of 2016, states that allow 17-year-olds to vote in primary elections and caucuses include: Alaska, Connecticut, Delaware, Hawaii, Illinois, Indiana, Iowa, Kentucky, Maine, Maryland, Mississippi, Nebraska, Nevada, North Carolina, Ohio, South Carolina, Virginia, Vermont, Washington, West Virginia, and Wyoming. The District of Columbia also allows 17-year-old voting. However, in Alaska, Hawaii, Washington, and Wyoming, 17-year-olds are only allowed to vote in the Democratic party elections. This can change, so check with your local party office for the current requirements. Prior to 1971, American citizens needed to be 21 in order to vote. Congress passed the 26th Amendment to the Constitution in March of that year, states quickly ratified it and President Richard M. Nixon signed it into law in July 1971. The argument for lowering the legal voting age from 21 to 18 began during World War II. Many argued that if young men could be drafted to fight in a war, they should be able to vote. This argument came back into the spotlight during the Vietnam War for the same reason. Today, many youth rights activists argue that the voting age should be lowered to 17, or even 16. Among the arguments for this change, is that it will give teenagers a chance to become involved in politics early and create lifetime voters. The United States is not alone in requiring citizens to be 18 to cast a vote. The majority of countries in the world also have an 18-year-old voting age. Austria, Brazil, Cuba, and Nicaragua are among countries that allow 16-year-olds to vote. A handful of countries allow 17-year-olds to vote. A few countries still do not allow voting until the age of 20 or 21. Should the U.S. Voting Age Be Lowered? Voting age has been a widely debated topic. Proponents say teenagers as young as 16 should be allowed to participate in government elections. Critics argue that younger teenagers won't get involved in elections and won't be able to cast quality votes. However, research on countries with younger voting ages shows that 16-year-olds are just as motivated to participate as their older counterparts. They also show the ability to cast votes that represent their best interests. Your teen doesn't have to wait until he's 18 to get involved in politics, however. Talk to your teen about any upcoming elections. Ask your teen who he would vote for if he were old enough. Discuss ballot issues and talk about how voters create change. Encourage him to research what the candidate stands for. And talk about his personal value systems that are behind his choices. If your teen expresses opinions contrary to yours, don't argue. Show that you are a good listener and that you value his opinion. Part of becoming his own person may involve thinking differently than you do. The earlier your teen begins to think about these things, the more likely he'll be to vote when he's old enough. Wagner M, Johann D, Kritzinger S. Voting at 16: Turnout and the quality of vote choice. Electoral Studies. 2012;31(2):372-383.